Snake Country came up just short. 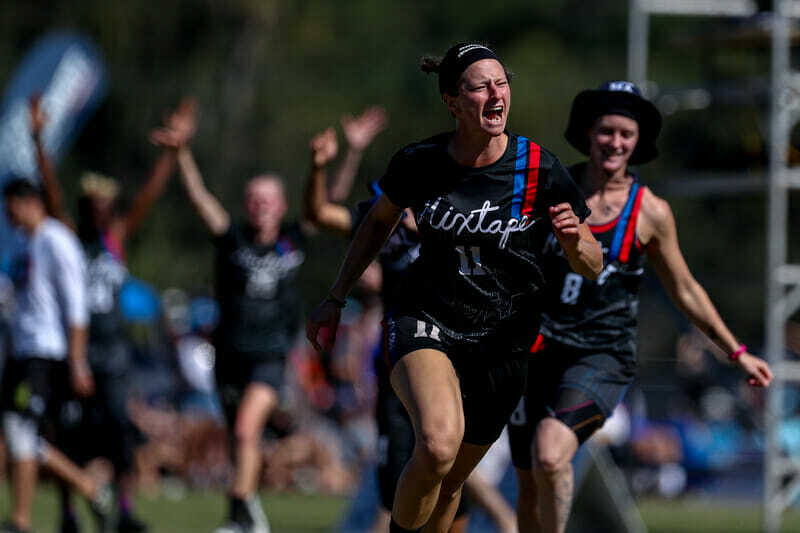 SAN DIEGO – Seattle Mixtape escaped a tough Boston Snake Country team with a 13-12 double game point victory to lock up a berth in the title game for the second straight year. Brad Houser (1G, 3A, 1D) and Mark Burton (4A) led the way on offense, and Ari Lozano had two huge blocks in the second half to push Mixtape over the top in a back and forth game. Lozano and Evan Klein helped pace a Seattle defense that was missing Khalif El-Salaam, who was out with an achilles injury. Neither team led by more than two points the whole way, and scoring chances were left on the field for both teams, but in the end Mixtape did just enough to pull away. Snake Country was paced by Peter Prial (3G, 2A, 1D), Kimberly Culpan (1G, 2A) and Piers MacNaughton (2G, 1A, 1D) all game, but they came up just short in the end. Defenses were stout from the outset. Both teams brought intense downfield pressure, and handlers were forced into a lot of high stall resets. Yardage gains were tough to come by. Mixtape flashed their offensive variety early on, coming out in a horizontal stack for their first offensive point and playing a two-person game between Burton and Paige Kercher to march down the field for their first hold. Snake Country was content to work the disc down the force sideline, with Prial, Brian Garcia, and Jake Taylor taking on the offensive handling duties. The stylistic differences between Seattle and Boston were on display from the start as well. Mixtape wants to play a high-energy, fast paced offense regardless of what tactics they employ. Snake Country preferred to isolate cutters and wait for the right cut to develop. Prial and Garcia looked comfortable holding until stall eight before looking to their reset, trusting that it would be there when they needed it. The first break of the game came with the teams tied at 2-2. With Boston content to wait for the right cuts to unfold, Seattle’s defensive pressure was bound to generate a turnover, and Garcia couldn’t connect with his reset to give Mixtape a break chance. Seattle looked deep immediately for Emily Smith-Wilson, but Reed Hendrickson’s huck sailed a bit too far. However, Seattle pressured Boston into overthrowing Jake Taylor on a reset and Mixtape took full advantage on their second chance, finding Lozano upline for the game’s first break. At this point, the wind started picking up and pushed multiple deep looks out of bounds. Boston and Seattle traded deep turnovers as hucks tailed away from their receivers, but Mixtape worked it to a finally healthy Dominic Cavalero, who found Hendrickson on a big inside-out backhand to go up 4-2, forcing a Boston timeout. Snake Country took that message to heart, and they chipped away at the lead. Erin Rea got a key block on a popped-up swing to set up a break for 5-5. After some clean offense on for both teams, Prial crossed over to the D-line to power another break to get Boston back on serve and take half 8-7. Coming out of half, Snake Country threw a 3-3-1 zone defense for the first time in the game and caught Seattle without a plan to escape the sideline trap. Jesse Bolton was pushed to the sideline, and without a reset available, tried a high-stall scoober which was blocked immediately by Jamie Quella. Snake Country tried a fast break but a dropped swing gave it back to Mixtape’s offense. A big huck to Brian Stout set up Mixtape for a quick hold, but a dropped swing for Seattle gave Boston another chance to break. An upline to Lexi Zalk gave Boston a 9-7 lead, and Mixtape looked on the ropes. Speaking with Burton after the game, he mentioned how the O-line had struggled to find the right balance of competitiveness, having fun, and valuing each other as teammates. “We told ourselves ‘We value each other, and we want to play well together, but there’s no tomorrow if we lose.’ Everyone stepped up, and we played much better O-line defense than we did in the first half after that.” Despite throwing turns, the offense was only broken once more, and the Mixtape defense ramped up to give Seattle a chance to get back into the game. Seattle pressured Boston into several high throws which were hung up in the wind, but Snake Country hauled in two straight second-effort goals to push their lead to 12-11. Mixtape played a quick split stack point to isolate Stout deep to tie it at 12-12, and set up double game point. Seattle pulled deep into the Boston end zone, and Mixtape’s defenders clamped down to trap Snake Country on the sideline. With Garcia up against the sideline and Cavalero’s long arms taking away the around, his only option was a late upline throw that Lozano read all the way. She pounced on the throw to earn the block, and Cavalero pushed upline from the handler spot to catch the winning goal past a diving Garcia to wrap up their trip to the final. Burton called out Cavalero and Lozano as the key difference makers at the end. Burton also called out El-Salaam’s contributions from the sideline. Seeing how he picked up his teammates when they were down, offered tactical adjustments to the D-line, and gave great sideline talk to keep his team on top of what Boston was up to. “He wasn’t playing, but it still felt like he was with us on the field,” said Burton. Snake Country can look back on their run through this season and call it a success. Being on the verge of a championship game appearance as a first-year team is no small feat, and if it weren’t for some impressive athletic displays from Mixtape, Boston would have a shot at a championship. In the end, Mixtape continues its run as one of the most successful mixed teams in this decade. They will make their fourth championship game appearance in the last five years. Expect a high-energy, fast-paced championship on Sunday morning as Seattle looks to repeat as champions in a rematch with Philadelphia AMP. Comments on "Mixtape Grits Their Way to Another Mixed Final"